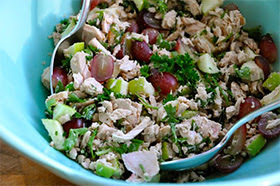 Here’s a simple and light version of tuna salad. It cuts out high-calorie mayonnaise and adds some chopped fruit and vegetables to really liven it up. This is a great recipe to enjoy as you journey towards your fitness goal. One serving equals: 314 calories, 15g fat, 12g carbohydrate, 183mg sodium, 2g fiber, and 33g protein. We hope that you get a chance to give this recipe a try this week. Remember that we are only a call or email away to assist you in all things fitness!